In other news, one of my photographs from this past February’s trip to the Guyanese rainforest has been used in an online article/blog post. Problem is, it’s in Dutch. Or German. Or Afrikaans. Or some such language I do not understand. So I have no idea what they are saying. Read it here. 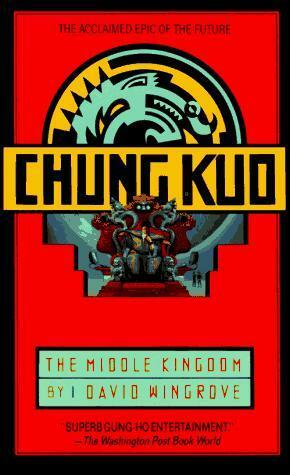 Today’s SF Book of the Day is the Chung Kuo series by David Wingrove. Now, this is an uneven series, and I am hesitant to recommend it without reservation. It’s a (somewhat) well planned 8-volume epic tale that is part action story, part political thriller, part speculative science fiction, and part revisionist history. See, it takes place in the near future, when the Chinese rule the world, and have remade global society in the image of the Confucian ideal, except that that ideal is a severely classist society of tyrranical extremes. Most curious about this new world is that world population is so great that the continents have each been transformed into sprawling cities. That’s right, Europe is a City. America is a City. Asia is a City. And so on. Your station in life is reflected in how high up (physically) you live in the City. The bottom of the bottom live beneath the City in darkness, upon the clay of the Earth, lightless and lawless. It’s a fascinating series of books, made more so by its complicated characters. Its protagonists are rarely heroes, and its heroes are never stainless, nor its villains without virtues. With each turn of the page, the unfolding of the story of Chung Kuo (Mandarin for “Middle Earth”… I think) is completely unpredictable. So why am I hesitant to give it an unqualified recommendation? Because when it came to the 8th and final book, it’s like David Wingrove was kidnapped by aliens and replaced with a retarded child who could barely spell. The final book is that bad. Unbelievably, turd-gurglingly bad. Thus, if you are going to read the grand epic of Chung Kuo, do yourself a favour and stop after the 7th book. Here’s a great review of the 8th book.